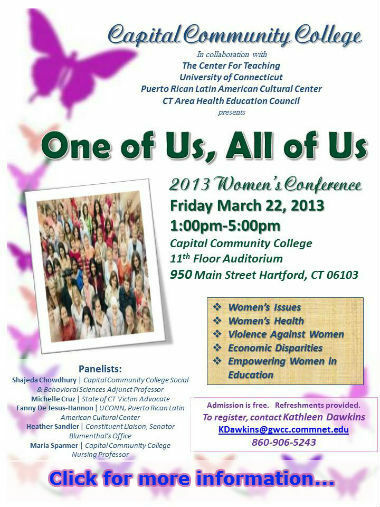 Capital Community College’s Center For Teaching and other organizations are hosting a “One of Us, All of Us” conference on women’s issues at the Centinel Hill Hall auditorium on Friday, March 22nd from 1 to 5 pm. Organized by CCC faculty members Miriam Mercado, Maria Sparmer, Jennifer Thomassen and Michelle White, the afternoon conference includes panel discussions and a resource fair. ~ The “One of Us, All of Us” conference is sponsored by The Center for Teaching in collaboration with the University of Connecticut, Puerto Rican Latin American Cultural Center and the CT Area Health Education Council with support from Capital Community College Foundation, Walmart, Big-Y Markets, and others. This entry was posted in Center for Teaching, Events. Bookmark the permalink.